Customize your patch with your text. The text will be done to match the blanket. You can apply to your shirts and other clothing, backpacks, towels, blankets, Christmas stockings, diapers bags, tote bags, purses, hats, scrapbooks, and more. Approximate size of patch: 2.25"w - 4" X 2.50 - 2.75"h ~ The length of you text will determine the patch width. The minimum width will start at 2.50" and maximum 4". The patch is an iron-on. The fabric is felt heat fused to stabilizer to make the fabric stronger. It also has a sticky iron-on backing to position patch before sewing or ironing it on. You can also use the patch as a sticker it you're using it for scrapbooking or other projects. 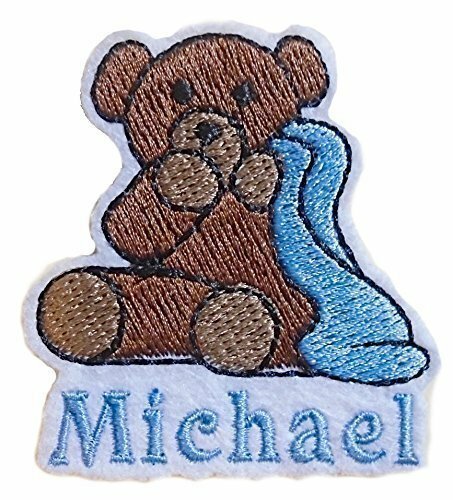 If you are using the patch on an item plan to wash it is highly recommended that also sew the patch on after ironing it on for longer lasting results. You can also adhere with fabri-tac or patch glue. If you have any questions about this product by Angie's Embroidery & Handmade Jewelry, contact us by completing and submitting the form below. If you are looking for a specif part number, please include it with your message.